It will remind you to invest each month, and urge you be consistent in your monthly investments. And if you enroll in an online trading service ( ColFinancial, BPI Trade, Wealth Securities, etc ), trading can be done online in the comfort of your home. Pingback: How to be a Stress Free Stock Investor | Join The Truly Rich Club! I’m interested but I dont know where to start. Have you opened an account at ColFinancial. If not apply for an online account at ColFinancial. In ColFinancial, you can even schedule the purchase of stocks at periodic intervals, using the Strategic Averaging method. Sayang, if you asked a few days earlier, I could have told you about the Nov 15 seminar at the PICC, by Bo Sanchez’s team, about getting started in stock market investing. I’m here working and living in Canada every once in a while I do research how to invest/buy stocks and what are the prerequisites?thank you. The last stock market seminar was last February 7. 85% of people who put money in the stock market lose money, so make sure you learn first before you put money into it! Hi Bro Bo, good afternoon. I’m a little bit confused here. I have read your ebook and some of your articles. As I recall, I’ve read that I have to pick about 5 companies and do peso cost averaging for long term and invest about “20 to 30 years”. Now I am confused why I need to sell. As per your advise, we need to sell BDO which is one of the company I picked. I thought, we don’t care about when the stocks are high since we are doing peso cost averaging and I thought i will be keeping it for 20 to 30 years. Please advice. First of all, this site is not Bro. Bo’s site. I am Bobet Prudente. Yes, you are supposed to hold on to stocks for many years and it is okay, to just hold on to it. But whenever a recommended stock’s price goes beyond the target price, the Truly Rich Club suggests we sell AND buy a different stock with a price that is lower than the “buy below” price. The important thing is that even if we sell, to keep the money invested in the stock market. im interested but how can start? You can start by joining the TrulyRichClub. Just click on the link and let Bro. Bo tell you about the club and how to join. 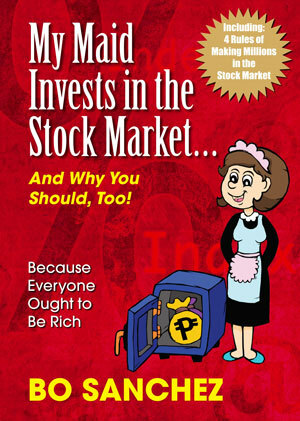 You can also download his FREE ebook My Maid Invests in the Stock Market. My name is Rhea ordinary OFW last 2years ago i bought your book my maid invest in stockmarket.It was very inspiring but i dont know why i forgot it and focus in other things coz maybe bz i have only short vacation in the Philippines at that time and need to back abroad to work again.Now i decided to have a longer vacation for my Mother’s sake.She got very ill so i want to take goodcare of her personally.Most of my savings i spent it for her medical needs.but no regrets coz i loved her and shes now much more better than before.its worth it.now bro.Bo i need your help for me to be able to secure my future like what your maids did.im not getting younger anymore and still single.Im totally ignorant about numbers how much more in stockmarkets.Maybe God makes away for this kind of opportunity to know you a littlebit more.thank you. sorry .who’s I’m talking too?I get interested becoz of Mr.bo Sanchez.I thought he is the one assisting me on how to invest.I’m sorry but I get confuse. I am Bobet Prudente. You can read more about me in the same site: http://www.trulyrichclub.biz/about-trulyrichclub-biz/. Bo Sanchez is a very busy person who gets thousands of emails everyday. He tries to read all, but can only reply to very few. Aral po muna bago mag-invest. 85% of people who invest in the stock market lose money, so it is very easy to lose money in the stock market. Joining the TrulyRichClub is a good start, because the TRC teacher you abundance mindset, theology of money and stock market investing. If you will not study nor plan to invest regularly, investing in a good equity mutual fund might be a better option. Hi Sir Bobet, I was already registered on your free seminar next week here in Makati, I would like to know if you have scheduled seminar on Sunday, because my work schedule is from Monday to Saturday so I don’t have much free time. But I was really interested to join the Truly Rich Club. Please advise. Thank you so much. 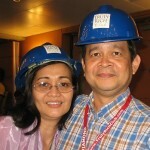 Hi Jemmalyn, the seminar in Makati is IMG TrulyRichMakers, not TrulyRichClub. The IMG TrulyRichMakers seminar is about saving and investing. The TrulyRichClub Quick Start seminars are about gaining financial wealth (mainly through the stock market) and spiritual abundance at the same time.